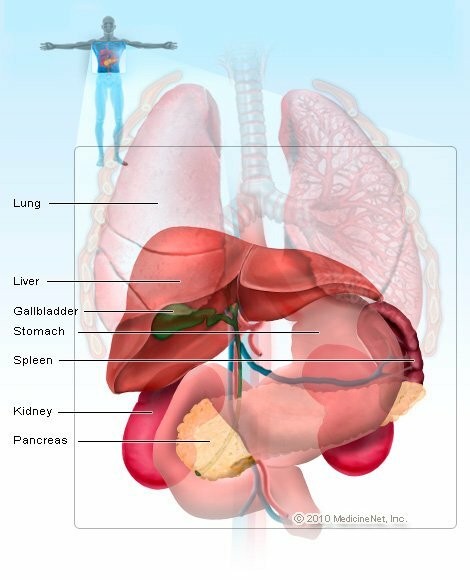 The spleen is an important organ in the immune system. It is a bean shaped structure, located in the left upper portion of the abdominal cavity, under the diaphragm, protected by the 9th through 11th ribs, in the mid-back. The spleen typically weighs 150 grams (5.3 oz) in a typical adult and spans about 11 cm (4.3 inches) vertically in its longest dimension. The functions of the spleen normally include clearance of invading organisms in the blood (bacteria) from the circulation, production of antibodies for the immune system, and removal of abnormal blood cells. The spleen can enlarge by performing its normal functions in response to another medical condition. Certain infections, diseases affecting blood cells, increased splenic blood flow, and diseases invading the spleen are some common reasons for the spleen to enlarge. Splenomegaly is not always abnormal, and spleen size may not necessarily say much about its function. A normal-sized spleen cannot be palpated (felt) during the physical examination of the abdomen, except in slender people. Enlarged spleen (splenomegaly) may be easier to palpate during careful abdominal examination. A small percentage of the normal American population may have a palpable or enlarged spleen. A spleen weighing up to 500 grams (1.1 pounds) or between 11 to 20 cm (4.3 to 8 inches) in its longest dimension is considered enlarged. Splenomegaly greater than 1000 gm (2 lb 3.3 oz) or longer than 20 cm (8 inches) is considered severe or massive. Splenomegaly does not have any specific symptoms. Vague abdominal pain and bloating are the most common, but still nonspecific, symptoms of an enlarged spleen. Some individuals with a very enlarged spleen may complain of early satiety (anorexia) and gastric reflux symptoms because of the stomach displacement and pressure on the stomach as a result of the enlarged spleen. Generally, people with splenomegaly may be cared for by the physician who is managing the underlying cause. For example, hematologists (doctors who specialize in treating blood disorders), oncologists (cancer specialists), and gastroenterologists (liver and digestive tract specialists) all commonly take care of patients who may have enlarged spleen as a response to another condition. Depending on the cause, individuals with splenomegaly may seek urgent doctor visits if they have evidence of bleeding, infection that is not well controlled at home, or severe abdominal pain. The most important aspect in evaluating splenomegaly is to find the underlying cause. Most of the time splenomegaly is detected incidentally on imaging studies, such as CT scans, that are done for another reason. An enlarged spleen can be felt by deep palpation of the left upper abdomen during physical examination, especially with deep inspiration as the diaphragm pushes the spleen further down into the abdominal cavity. A mildly enlarged spleen may not be appreciated on an abdominal exam, unless examined carefully. If splenomegaly is detected, a complete blood count (CBC) and a blood smear are usually ordered to review the number, shape, and composition of white blood cells, red blood cells, and platelets. Other blood tests that may be helpful include a metabolic panel (blood chemistry) and liver function tests. Aside from CT scanning, other imaging tests which can help in evaluating splenomegaly include ultrasound of the abdomen, angiography, and liver-spleen scans. or if an infection is suspected, then finding the source of the infection will become the primary objective. A bone marrow biopsy may be done if Mycobacterium infection, Gaucher disease, or leukemia are considerations. Biopsy of the spleen is rarely preformed, especially in the United States, because of the high risk of bleeding. Splenectomy (removing the spleen) and microscopic analysis of the removed spleen can be performed if the risk of surgery is outweighed by the value of determining the exact cause and its subsequent treatment. Enlarged spleen is generally caused by another medical condition that will require medical treatment. In many conditions, the spleen enlarges a result of performing its normal physiologic function in response to another medical condition, for example, cirrhosis. The main objective is then not necessarily to improve splenomegaly that is a consequence of the disease, but to treat the underlying cause, such as cirrhosis. In many other situations, such as infections, lymphomas, or leukemias, again the treatment is directed towards the underlying disorder, using antibiotics or chemotherapy. Occasionally, the indicated treatment is surgical removal of the spleen (splenectomy) in order to control the causative conditions. Some conditions in which splenectomy may be considered are hairy cell leukemia, thalassemia major, splenic vein thrombosis, Gaucher disease, and ITP. A careful consideration of risks versus benefits of surgery is the most prudent approach. It is important to note the importance of vaccination in cases of splenectomy. People without a spleen (asplenia) are at a high risk for significant infections with Streptococcus pneumoniae, Neisseria meningitidis, and Hemophilus influenzae. Therefore, vaccination against these bacteria (pneumococcal vaccine, meningococcal vaccine, hemophilus vaccine) is strongly recommended in anyone who undergoes splenectomy. Depending upon the cause, the enlarged spleen may return to normal size and function when the underlying disease is treated or resolved. Commonly, in infectious mononucleosis, the spleen returns to normal as the infection gets better. In some circumstances, removing the spleen is part of the treatment, but it can make the person much more susceptible to infections. Many illnesses and diseases result with the enlarged spleen as a permanent physical finding and may result in only a fair prognosis because the person may be more prone to splenic injury, infections, and abnormal bleeding. Follow-up with the treating physician is an important process as many complications can occur if patients are not compliant with medical recommendations. Prevention of splenomegaly in itself may be meaningless. Some of the medical causes of splenomegaly, however, may be preventable, such as cessation of alcohol abuse to prevent liver cirrhosis, or prophylaxis against malaria when planning a trip to an endemic area. Preventive measures against a possible rupture of spleen are noteworthy. Avoiding contact sports and wearing seat belts are important measures to take in the prevention of splenic rupture. Proper vaccination in patients with splenectomy is also of great significance as noted earlier. O'Reilly, RA. Splenomegaly in 2,505 patients at a large university medical center from 1913 to 1995. 1963 to 1995: 449 patients. West J Med 1998; 169:88. What were the symptoms of your enlarged spleen? Tell us about your experience with enlarged spleen (splenomegaly).